PROBLEM: Lilah, my 5 year old, spends quite a bit of time in my studio. Yes, she makes a big mess. Typical. But her mess... ahem... "creative play" has been migrating across the room. Closer to where I work. In fact, she had taken over one of my primary work spaces! Hey Lilah! 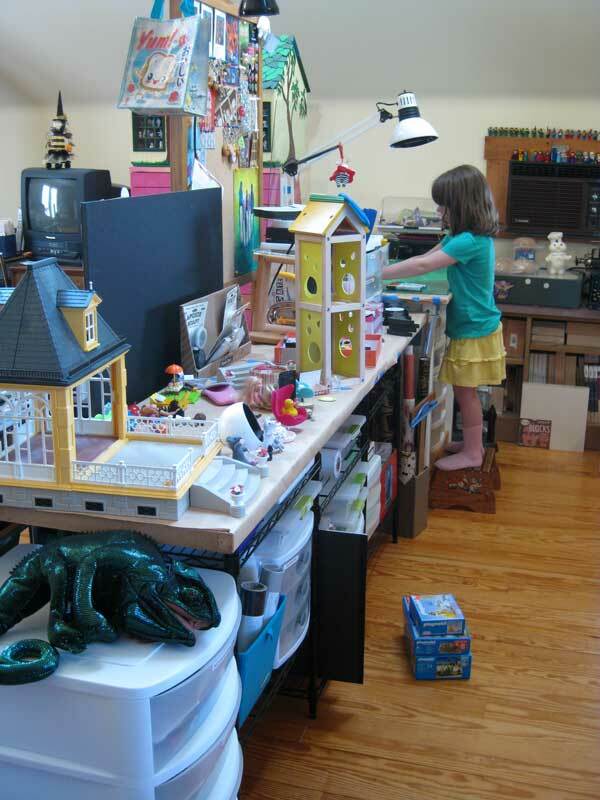 that's MY worktable!! 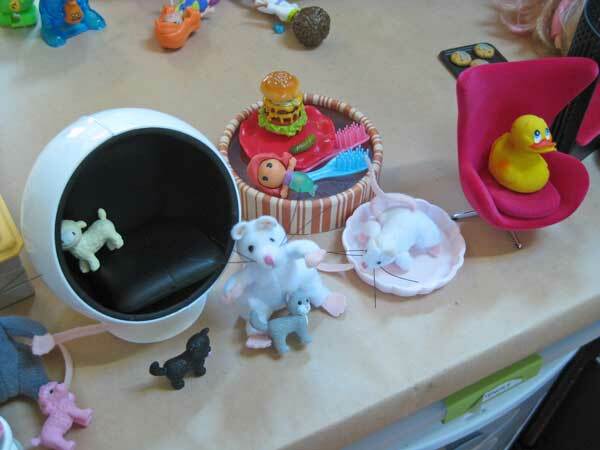 I am very proud of her complete integration of all types of toys - cats, dogs, mice, Rement foods, wind-up UglyDolls, tiny eraser-Disney-princesses, a teeny rubber duck, and, my collectible designer chairs... hey!? OK, so I need my space back now! But Lilah needs a place to play. SOLUTION: We made a play-mat-table. For the floor. But fancy. Lilah: "Is it dry yet?" Lilah: "Is it dry NOW?" Lilah: "Good grief - Is it dry NOW?" Me: "Hey, look at that - it's dry!" We got out the Sharpie oil-based paint markers and started adding the garden. Which, of course, has a big rainbow in the middle. And some bugs, a lilac bush, and a patch of flowers that are "perfectly fine to be picked". (That means, NO ONE will yell.) And a river with teeny goldfish on parade. 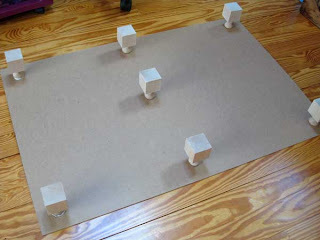 Meanwhile, I attached wooden craft pieces to the bottom of another sheet, using Weldbond glue. Good stuff. I used Weldbond to glue the painted sheet to the footed sheet and clamped the pieces together with bulldog clips. Three hours later, my counter is clear, clear, clear! 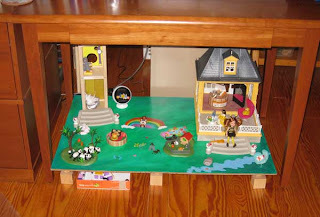 And the fully loaded garden (Playmobils, Barbie kids, and all) slides under my desk. Woohoo! When everything around you feels like chaos and even your own mother is disappointed in you... it is very easy to forget your purpose. Assuming you ever knew it in the first place. You give yourself points for keeping your head above water and repeat over and over "Keep swimming, keep swimming." (Yes, Dory from "Nemo"). Come to think - maybe Dory has another lesson - because she constantly forgets what she has just done or who she has met, everything is constantly new for her. Hmmm... I need to ponder that one too. Anyway. "Stupidity is doing the same thing over and over and expecting a different result." I was trying to remember why I felt so much MORE confident last year even though it was filled with insane events that were not in my control. Sure, I whined plenty last year, but I FELT more in control of my own actions and feelings. Is that confidence? This year, as part of my feeling-like-I have-to-solve-everyone's-problems I've thought about moving my studio downstairs where Wingdoodle (my recently closed store) used to be. I've been agonizing over what to call it - The Belfry- doesn't really work for a ground floor space, how do I fit all my stuff into that space, and how do I run another store when I can barely keep up with all my current endeavors? Yep, I have seriously been making myself crazy with these stupid thoughts. Yet, when you finally get angry enough to want to scream - that's when you actually find out what is important to you - my inner child is yelling "but I don't WANT to move! I don't WANT to run a store! I don't WANT to be responsible for solving YOUR problems!" Interesting. I am a problem solver. Some people would call me an artist. My mother calls me flaky. But I work in whatever medium is required to solve the problem. It might be acrylic paint, glass, dirt, teaching Zentangle or database design. "Problems" are not always bad things - often they are just situations that need ideas or solutions. And many, many times, there is no one within ten miles of me who can actually see the problem that I am addressing. Once the problem is dealt with, there is no point (for me) in doing the same thing. To many people, it appears that I lose interest or I move on to something else. Flaky. If I continue in the same vein, repeating something - like running a store, or other repetitive work - I get depressed and lose all my confidence. If I continue to solve things and do new things, I gain confidence, make friends, make money, and I'm pretty much happy. It makes sense. The one area where I seem to get really snagged is in the area of solving problems FOR a person. I KNOW that you can't change other people. I KNOW that, but my brain can't distinguish one challenge from another. What I have recently come to understand is that my confidence is reinforced from helping people to learn to solve their OWN problems. No, not like a therapist, more like a Zentangle teacher. I have been explaining Zentangle for years as a way to teach creative confidence. I have noticed that even the Zentangle people have taken that tagline as their own to replace "meditation" in their descriptions. Because that's what everything important boils down to: creative confidence. People with creative confidence not only can solve their own problems, they take responsibility for themselves (thus decreasing their negative impact on those around them), and they see the world as basically a good place with some "problems" that need tweaking. Here is a wonderful TED talk by David Kelley on this very subject. Creative confidence is what powers our perception. What he says about the people who are afraid of snakes makes sense, but the example of the MRI machines is just a whack to the side of the head. "DUH!?" We are afraid of things because we are told to be afraid of them. We make everything so much more complicated than it really is. It's all perception. If I hear the words "CT scan", "radiation", "Xray", "needle"... agh, my hands start to sweat. I have had plenty of bad experiences with all those things and more. But take a look at the MRI room in this video.... ohmigosh it looks like FUN! Hospitals are cold, impersonal and terrifying. What else would you expect? But one person saw it as a problem to be solved, had a vision of how to fix it - his friends thought he was crazy - but he made it real anyway. And now it seems so obvious to everyone. So instead of feeling cut off from people because they don't see what I see, perhaps my purpose in life is to help change what others are seeing? The Wild Thing is Dead. Long-live the Wild Thing. I left space for a caption over my head... but still, I have no words. 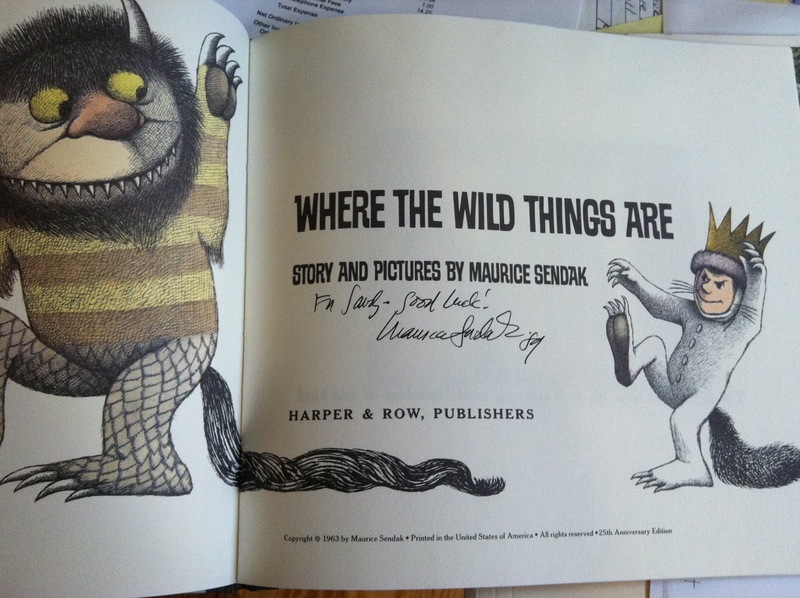 It might seem obvious to anyone who knows me, but Maurice Sendak is my hero. Like few other illustrators, he has had a huge influence on my art style and my persistence. 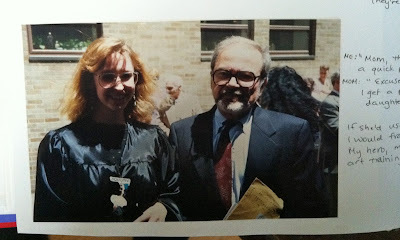 Sendak was the Commencement speaker at RISD when I finally graduated. I thought my heart would burst from happiness. And yet I had no idea what to say to him. 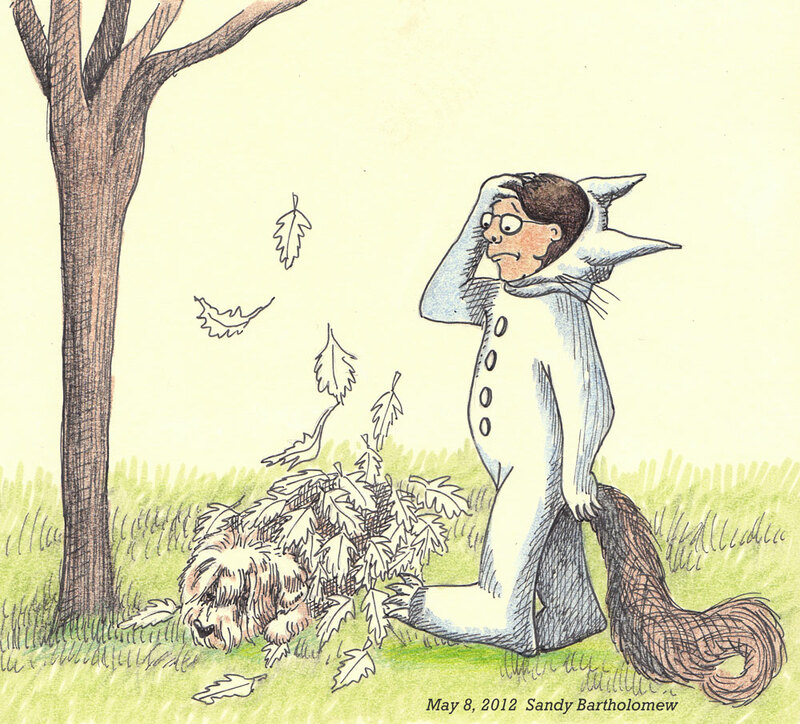 Sendak's stories are all so creepy and sad, but that's what is so appealing to me - and other kids. He knew what we were feeling and what we were worrying about and then turned it all into characters and magical places we could understand. I waited in line for over an hour. Again, I had no idea what to say. In my head, I was thinking "I want to do this! (make books that people love and will stand in line just to have me scribble in them)." As a parent, reading the stories to my son, I was hit by all the "realities" of his stories. All the things I just accepted as a child, I suddenly noticed as being sad, as an adult. For example... in Higglety-Pigglety-Pop... as a kid, I understood that Jennie, the dog, wanted more out of life and was willing to give up everything to have an adventure. When she died, I cried (I still do), but it was all part of the story and her adventure. After all, she finally gets what she wants, in the end. As an adult, I can't help but over analyze and feel depressed. I bet there are a few of you who have only read this book as an adult who may be thinking, "What does she mean, the dog dies?!" 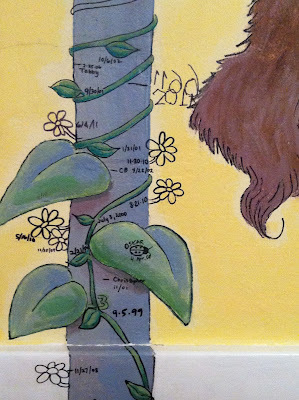 I painted this scene in my living room, 14 years ago, and I've used it as a growth chart for my kids and family members. Sendak, my imaginary mentor, cleared the path for weird, sickly kids with overactive imaginations! Hee hee. I am very grateful that I was able to meet him and that he lived such a long and interesting life. He is immortal through his art and his stories. But he will be missed. The leaves on the vine mark my son's growth, and the little flowers mark my daughter's. Ladybugs are for other friends and family. 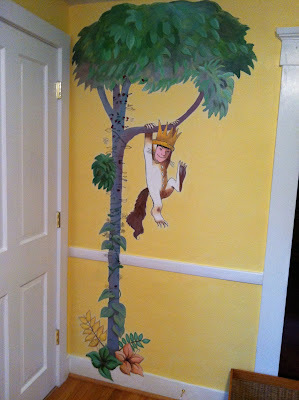 You can see how I stopped painting in the vine, and all my daughter's flowers are unpainted too. Bad mommy. 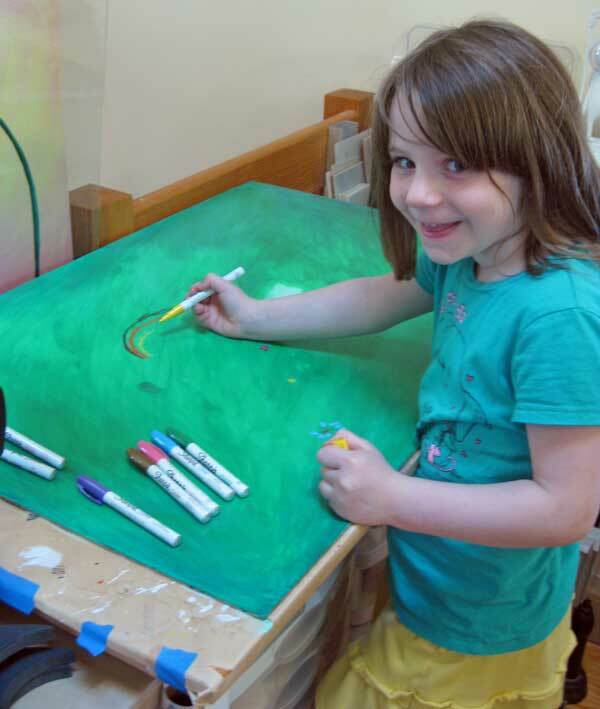 For her fifth birthday, Lilah found the Sharpie and measured herself! "11-66-2011" Close enough (11-26-2011). There is a great article in the New York Times if you would like to read more about Maurice Sendak's life. 1. a real divorce, involving a guy I'd been married to for almost 19 years. (And lived with for 23). 3. my publisher - in this case, I played the roll of one of the children and suffered through the chaos and confusion as the Parenting Plan was tweaked. (3.5. - I'm not going to count the nightmare with the contractor because that wasn't a long-term relationship). 4. my employees - I'm still not sure how so much hatred and anger could be generated, just by admitting failure. Doesn't mean I'm over cause you're gone..."
This is the kind of break-up song that you crank up really loud, sing at the top of your lungs, and shake your fist at the sky. And when it is over... you wonder if it's really true. I couldn't figure out WHY it only feels right while it's playing. When I got home, I looked it up on YouTube and I noticed, in the music video, sure enough, lots of people shaking their fists and singing really loud... but always in GROUPS. I think it is so much easier to "stand tall" and be indignant, etc. when you have a posse. That line: "Doesn't mean I'm lonely when I'm alone" is the loose link. OK, I can believe that I am a strong person for having gone through all this crap. And then some more crap. And a little more. (Oh, drat, there's another pile!) But what if I DO feel lonely? Does that negate all the other fist-pumping stuff? You know how people talk about "thoughts become things" and you can't move on and get new experiences, etc. if you don't unload the old, bad ones... people too...? All that stuff is true. And as I unloaded all these bad people (not always by my own choice), I realized the formula is not exactly one-to-one. ie: One bad person gone = one new good person. Nope. I think it's by weight! One really, really bad person gone = a whole bunch of new people. Seriously. I have met more new, super-cool people in the last year than I had met... EVER. And I started to wonder if maybe I wasn't really as introverted as I had previously thought. Here's what I discovered: if you have two friends (counting the husband) and they are both "bad" for you, when they aren't around, you feel pretty good, right? Now let's say you have two friends who are fun and creative and like to laugh... when they aren't around, you feel... what? Yep, lonely. So, that's where I am right now. I am working on rewiring my thoughts and beliefs. Some of it is very uncomfortable and some (because that's hard-wired into my personailty!) are really EXCITING!